The winter weather has been good to us (so far)! 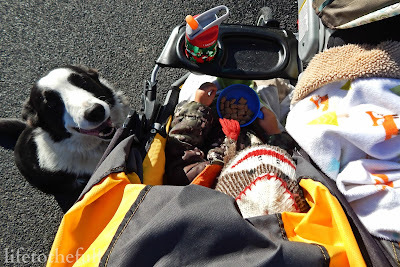 My boys and I have been able to get outside for quite a few walks lately. Taking the dog for a walk - or run - around the neighborhood is one of our favorite activities any time of the year. We love our pup. He is a part of our family! When we are trying to keep busy indoors, E insists that we read the ASPCA kids: Rescue Readers book series over and over again. He's not just a dog lover; E loves animals in general. As a Moms Meet blogger, I received this book series to review and share with you. Studio Fun International has partnered with the American Society for the Prevention of Cruelty to Animals (ASPCA®) to create the educational ASPCA kids: Rescue Readers book series. These stories are cute, easy to read and funny plus they teach your child the importance of caring for, protecting, and loving animals. What's the best part about this book series? For every book sold, 4–5 percent of the purchase price goes directly to the ASPCA to help continue it’s mission! 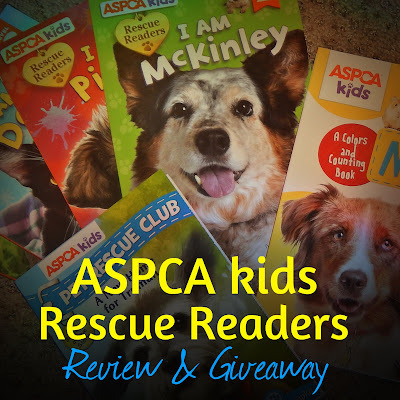 The ASPCA kids: Rescue Reader series features the rescue stories of four different animals: McKinley and Picasso the dogs, Daisy the Cat and Nibbles the Guinea Pig. The Rescue Readers series creates a fun and educational hands-on experience written at a Level 2 reading level for early readers. The books were short enough to keep my 2.5-year-old's attention but long enough to carry a story line. They will be a perfect resource for us as he learns to read on his own in the future. Reading together is our favorite indoor activity. It's even better when we can read about pets and know that we are helping the ASPCA's mission by reading this series. As a bonus, the books in this series have been very durable. Baby W, who is 6 months old, has been attempting to eat the books as we read them and they have been able to withstand the baby slobber! This series is available in paperback, library binding hardcovers, and e-books. The paperback books are priced at $3.99 (each) or $15.96 (for all four) everywhere books are sold. Studio Fun International also sent me a two book set of ASPCA kids: Rescue Readers to raffle off to my readers. That's YOU! Enter the giveaway below to win. These books would be the perfect stocking stuffer for the special little person in your life! Books and kids go hand in hand. Love the pic of you reading with the little ones. Kids love stories about pets and rescuing! Such a great idea that the ASPCA came up with this book set. I would keep these for my two young kids, I have a six year old who is just learning to read so he needs easy to read book and a four year who LOVES animals and being read to by her brother.